Meh. Bygones. I’m over it. 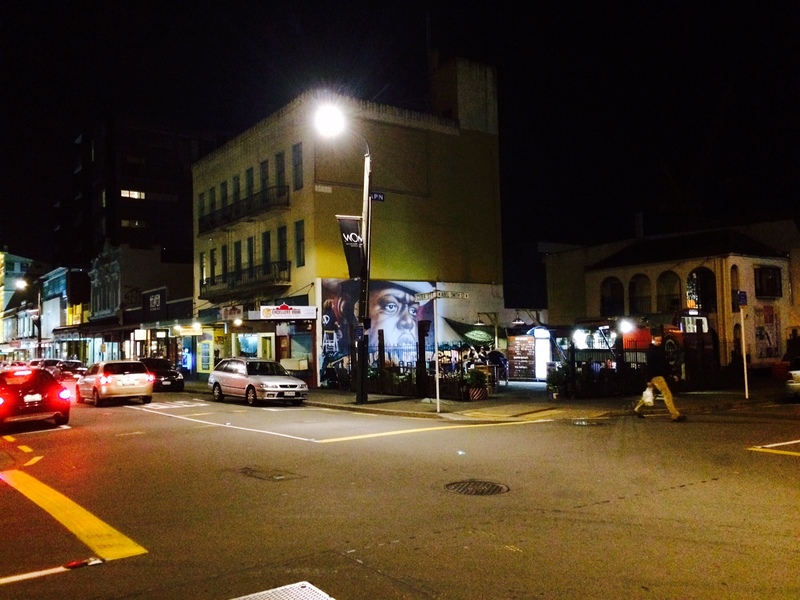 What Wellington needs now, and seems very good at providing it, is a fresh start on an old street corner, and the corner of Abel Tasman and Cuba Street seems just the right place to do that. Wandering around this slightly forsaken part of town the other night, I hadn’t really realized just how funky and vibrant a mere street corner renovation can be. It’s not down to any particular governmental, or council idealistic drive, but just a simple effort by local entrepreneurs who want to make a difference. There are of course 4 corners at this intersection – one of the most notoriously uncontrolled road intersections in town. Four stop signs, all people must give halt their vehicles, and to be honest, it seems no one knows what to do. There’s two rules at play here, maybe even three. First up there is the “First in, first served” rule. That seems to mean that if you arrive at the corner first, you get to drive away first. Secondly there is the official rule, which everyone forgets after they have passed their drivers license, and so only a 16 year old would really know, but I think it goes something like this: “Give way to those on your right”. Then there is the “Turning traffic gives way to straight-ahead traffic” rule. And lastly, only used when a truck comes down the road, there is the “Might is right” rule, whereby smaller cars give way to bigger trucks. Of course, then there are the locals, who cycle, skateboard, and walk through the intersection any way they goddam like, and ignore all of the above. All in all, it is Cuba madness at its best, and it assures that traffic passes very slowly through this intersection at all times. So: now for the buildings. I’m recording it now, because I have a feeling this is going to change. As an urban design exercise, it is a complete flop on paper, yet it is quietly compelling in real life. Two corners have open yards, of which one is a car rental yard, and the other also used to be, not so long ago. The other two corners have some of the crappest architecture in Wellington, and yet, and yet, and yet: this corner is buzzing. The most “polished” complete building is the two storey Po-Mo “masterpiece” that once recently was Real Groovy Records, and now is Advance Electrical Wholesale depot. Guys: you’re out of place, and should move on. I’d say bring back Real Groovy, but even I am not that much of a fantasist. But electrical fittings just doesn’t seem like the best use for the site. It’s also, at times, the hangout for the few Last, Loneliest, Loveliest hookers that still walk the streets of Wellington. Perhaps the excitement of the vagaries of the corner’s rules of stopping provides them with regular trade. On the next corner is the most amazing transformation of all. 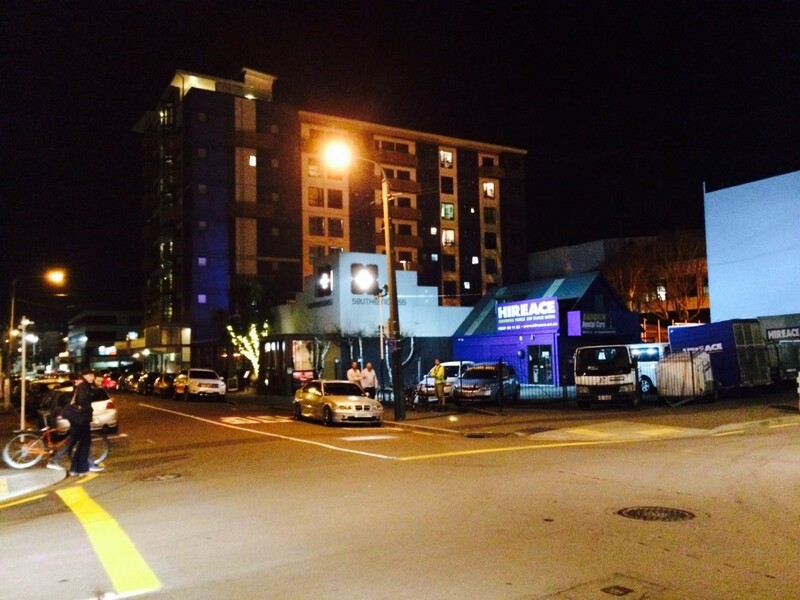 The 55 Minute Dry Cleaners building, owned by the feisty and ever-so-slightly bonkers Mr Patel, was on the list of Wellington’s Most Wanted for seismic offenses. I don’t know why, or how, considering that it is not much taller than a packet of squirrels, but allegedly it w in grave danger of falling down. Strengthened, refurbished, and restored to look just as crap as before, the paintwork was unchanged and it still proudly calls itself 55 Minute Drycleaners, even if there is a new, cool and funky bar / cafe / restaurant joint inside instead. These guys are so hip, it’s a wonder their pants stay on. It is the classic Wellington anti-hero position: take the ugliest building, make sure it stays even uglier, and it will guarantee to be the coolest place in town. 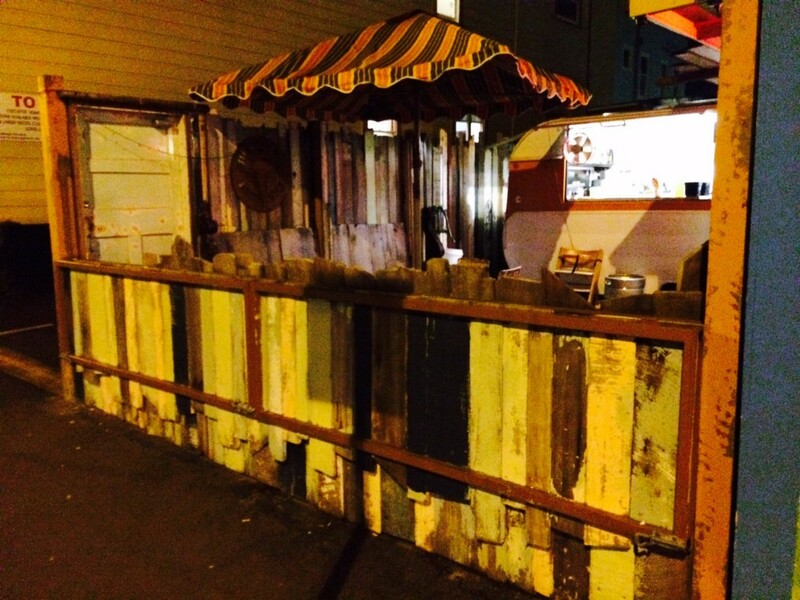 No studied elegance here: crapness reigns, and inside, good coffee abounds. The next corner over has also had a makeover, changing from empty former car yard into bustling burger joint for Ekim Burgers. An old battered caravan parked on the angle, a few seatish things, some dope music and cooks, and Ekim is the coolest thing on two wheels, with the exception of the cool place across the road. It is a lesson on how to run a business in Wellington – the poor old Indian restaurant next door never had a chance, trying incarnation after incarnation, offering cheap Indian meals, and clean table cloths, with friendly table service, when what really works for Wellington is tattoos, crazy names for burgers, and a friendly attitude that doesn’t try too hard. Long may Ekim Burgers rule the waves! And then there is the last corner. It’s a shed really, functioning as a slightly delapidated car rental place, HireAce, that I am guessing only has a short term lease on the joint. 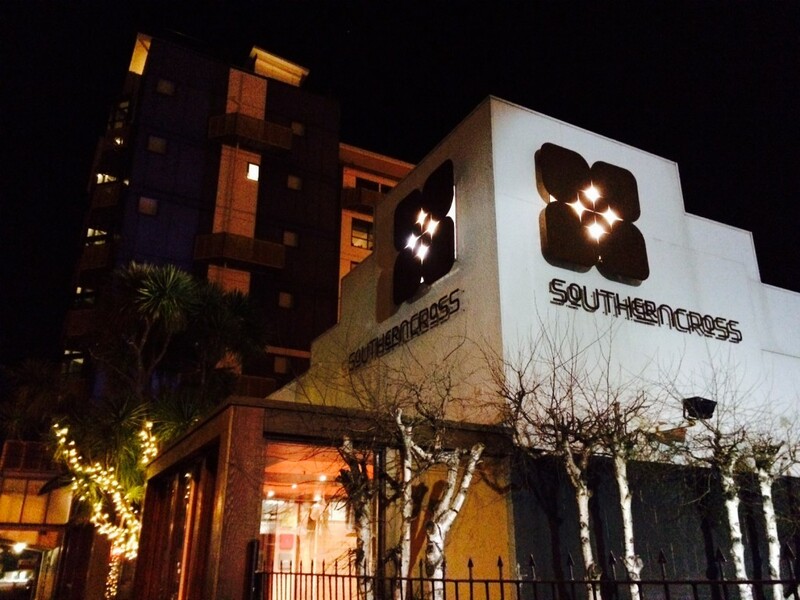 Behind it is the Southern Cross bar and restaurant – as if you didn’t already know. Of course you do – this place is a classic Wellington joint. A regular haunt of the Fish, going down on Sundays to dance with the Brazilians, and a firm favourite of the garden bar. The garden bar is a marvel of modern design – by local architect of colorful anarchy, John Mills, who has woven together an atmosphere of inside outness that works all day long. Mr Mills, if Fish wore hats, I’d take mine off to you right now. The Southern Cross is an eclectic bag of design delights, coupled with some of the sexiest and friendliest bar staff on the planet (although the disappearance of the short Brit who worked there recently is sadly noted). The empty corner outside the Cross is a worry, as it sits directly in the way of the sunlit that pours into the garden bar, and any effort to develop the corner site would surely have a detrimental effect on the warmth and liveliness of the outside bar. 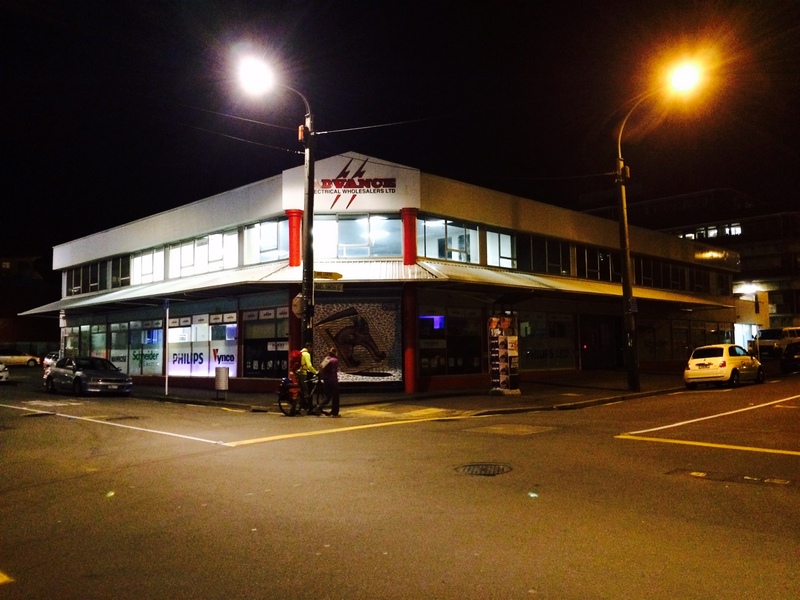 In the mean time, soak up the ambience of the best corner in Te Aro. See you there. Inspirational cover photo! Lovely. Who is the big dude on the wall? Thanks 60 – had no recollection of even writing that. No idea where that even came from. Graham – I think it might be CeeLo Green, but I can’t be sure. It’s an interesting image, I agree, and I’m not sure who it’s by either – but, so, it’s a poster, of a person up a ladder, graffiting a poster, on the side of a wall, to cover the graffiti. And yes, the complex depths of dark and light perfectly captured by the iPhone snap…. “the most notoriously uncontrolled road intersections in town” interestingly that intersection reminds me of a shared space philosophy where the indecision requires drivers to be more alert so reducing accidents. I’m not sure if it works that way though. Oh and the big dude is Biggie, I would say you are out of touch but then he did die 17 years ago so he must be too old school. 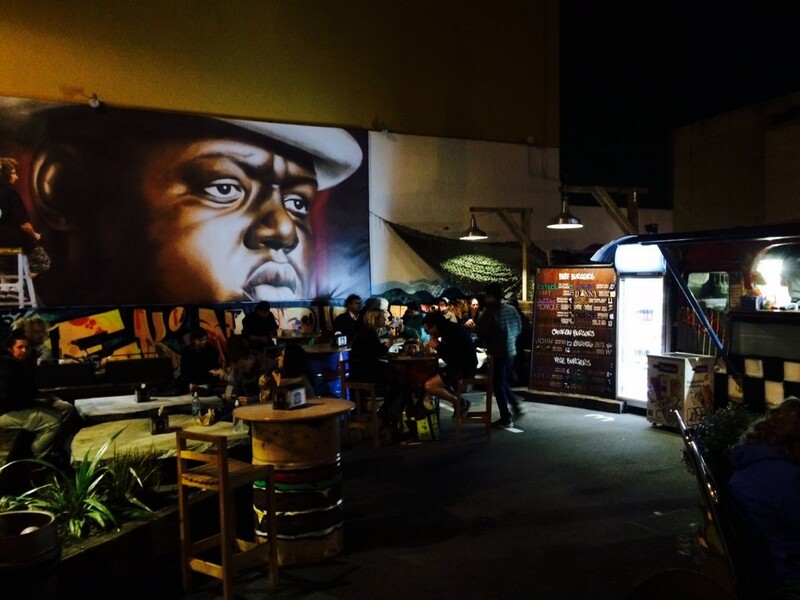 Oh, of course, the Notorious BIG. Yes, you’re right. I’m more of a Tupac fan myself…. Rolling with the West Side baby, knowwhatimsaying y’all? On the right-of-way thing, the important part that most people miss is that the stop sign takes priority over giving way to one way or the other. In most cases, it becomes something like a fifo unless people are stopping at the same time. I’ve seen far too many people running the stop because the only other traffic is on the left. It’s wrong, but so many people don’t know what’s right and wrong that it just happens. Since no one has ever been tested on a 4-way stop, nor is likely to, I don’t expect the situation will ever change. — Abel Smith Street, surely? This one here: http://goo.gl/maps/CmtyB ? Street view still has Real Groovy there. Chris – you know, you are absolutely right. Lived here for years, and still the words Abel Tasman still trip off my tongue easier than Abel Smith. But yes, Real Groovy has gone bust and left town. There is a very nice electrical supplies store there now, Advance! 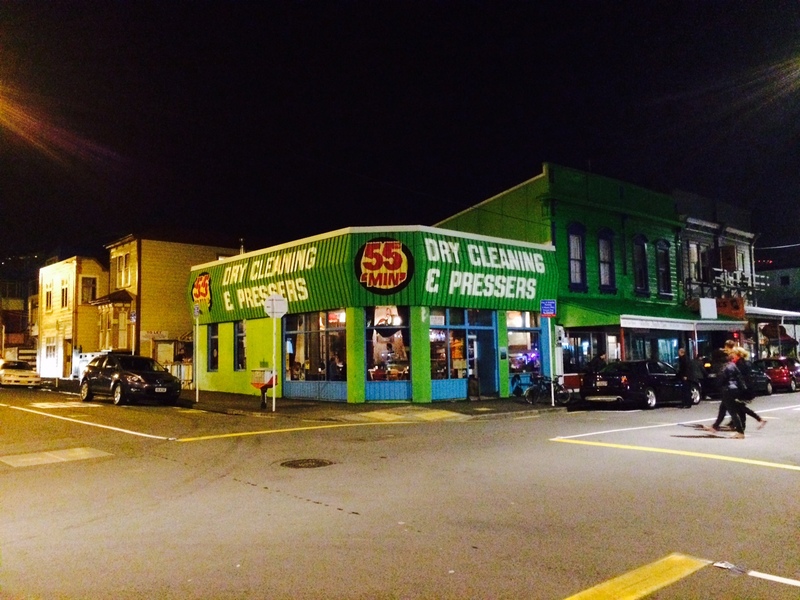 And the name of the cafe in the 55 minute Drycleaners is, you guessed it: Laundry.